This classic vegetable dish of bok choy with ginger and oyster sauce is a good opportunity to practice your stir-frying technique. For best results, prepare all the ingredients before starting to cook, get the oil really hot, and keep the food constantly moving in the wok. Trim off the hard stalk ends of 200 g (7 oz) bok choy; cut the rest into 5 cm (2 inches) pieces (about 3 cups). Peel a small knob of fresh root ginger, and slice into 1 tablespoon fine shreds. Heat 2 tablespoons peanut (groundnut) oil or similar oil in a wok until very hot. Add the ginger, and stir with a wok ladle until light brown. Add the firm white stem sections of the bok choy, and continue stir-frying over a high heat for 2 minutes, constantly flipping the ingredients away from the hot base of the wok using the ladle. Moving the food rapidly and constantly in the wok ensures that it does not overcook and also that it cooks evenly. 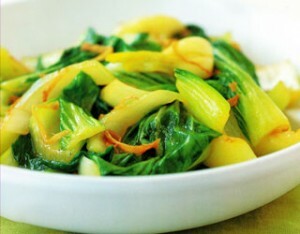 Stir in the green leafy parts of the bok choy, then add 1 tablespoon oyster sauce and 100 ml (scant ½ cup) water. Continue stir-frying until the liquid comes to a rapid boil. Quickly transfer the contents of the wok to a serving dish – the wok’s sloping sides help to make this easy – and serve immediately while still hot.